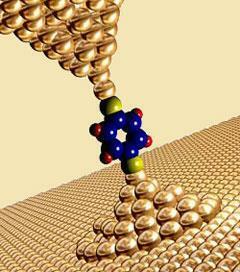 US researchers have successfully demonstrated the thermoelectric effect in an organic molecule. Until now, thermoelectricity - the generation of electricity directly from heat - has largely been confined to systems consisting of metals or inorganic semiconductors. The findings open up the possibility of potential new energy sources, and also present a novel way for probing the electronic structure of molecular junctions, something that is crucial for the development of the field of molecular electronics. Arun Majumdar and colleagues at the University of California, Berkeley, coated a gold surface with molecules of benzenedithiol, dibenzenedithiol or tribenzenedithiol. They then lowered the gold tip of a modified atomic force microscope toward this surface to trap the organic molecules in place. A temperature difference was then generated across the two gold electrodes, which in turn generated a voltage. For each degree Celsius of difference, the researchers measured 8.7 microvolts for benzenedithiol, 12.9 microvolts for dibenzenedithiol and 14.2 microvolts for tribenzenedithiol. ’The effect may seem quite small now, but this is a significant proof of concept and the first step in organic molecular thermoelectricity,’ said Pramod Reddy, one of the research team. The phenomenon is known as the Seebeck effect, and was first observed almost 200 years ago. It is commonly seen where the junctions of two different metals are kept at different temperatures to generate a voltage, but it has proved difficult to exploit the process to produce efficient power generators. Most systems require expensive metals such as bismuth and tellerium, making them costly to manufacture. The California researchers are hopeful that their work marks a breakthrough in thermoelectricity and that more cost-effective thermoelectric converters might be possible with organic-based systems. This view was echoed by Majumdar: ’The use of inexpensive organic molecules and metal nanoparticles offers the promise of low-cost, plastic-like power generators and refrigerators,’ he said. The research team now proposes to test different organic molecules and metals and fine-tune the assembly of their system.